It's finally that time everyone- time to get super pumped for the most epic monthly group giveaway! I've teamed up with some absolutely incredible ladies to put together this event. We wanted to bring a little something new to the mix this month and offer a mega mini bundle you'd never forget! Yup. 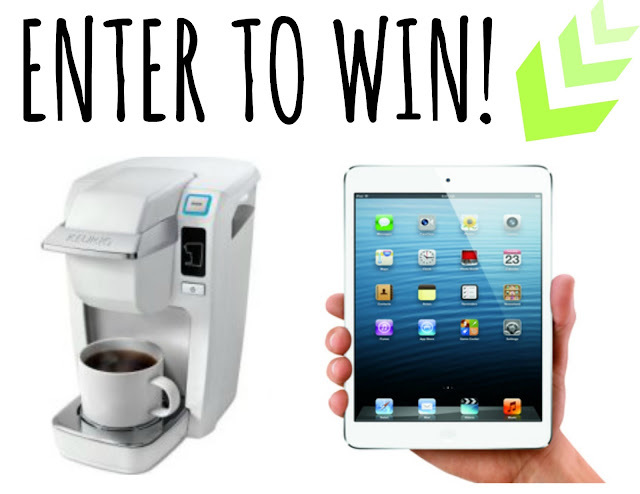 You saw right, one lucky winner will walk away with an iPad Mini and Keurig Mini. How stinkin' 'awesome is that? Seriously. I can't even begin to explain how jelly I am not being able to enter. I mean, really. These prizes are a bloggers dream come true. Coffee and a Tablet. What more could ya' ask for? Also would be a killer mothers day present for those not so cracked out addicted to caffeine like myself. LOVE, LOVE , LOVE this "mini" giveaway idea! I am also excited to follow your blog. know if i can get on this site with no any risk. A person currently bought on amazon?